These muffins are so yummy! They were moist and tender and had a great blast of chocolate flavor without being too rich. 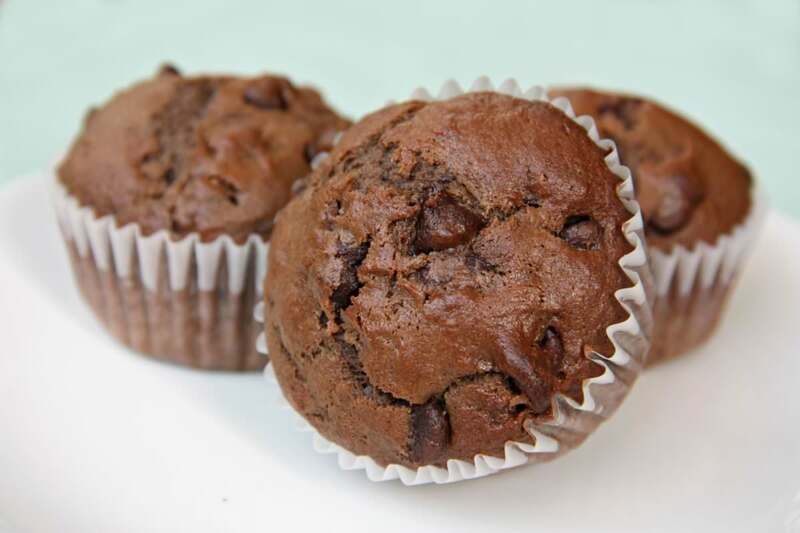 The melty chocolate chips inside each muffin made them even more chocolatey and perfect. My whole family gave them two big thumbs up. We love making banana muffins with our ripe bananas, but I love having another option and these chocolate banana muffins are a great option. The only hard part will be deciding which muffins to make when I have over ripe bananas! In a medium bowl, add the cocoa, flour, baking soda, baking powder, cream of tartar and salt and whisk to combine. Set aside. In a large mixing bowl, beat the shortening and sugar until smooth and then beat in the eggs and vanilla. Slowly add a little of the flour, mix, a little of the banana, mix, and continue to alternate between the two. Fold in the chocolate chips. Fill each muffin tin 2/3 full.